Canva is an extraordinary tool when used well. It’s easy to use, the dashboard is well organised, and templates are incredibly easy to make and use, so that creating multiple social media graphics based on a singular layout is a cinch. But, should you use the free or paid Canva? Well, like so many things, it depends entirely on your circumstances. And I’m here to tell you, that in 99% of cases for solopreneurs (which is pretty much aaaaaaall my readership) that you don’t need the paid version. Seriously. If you desire some of the features that Canva For Work has, then in most cases for you solopreneurs, there are much better alternatives. Firstly, let’s look at the free version of Canva. I’m sure you’ve noticed there are some great templates for most applications (e.g. Facebook posts, business cards, presentations, and oodles more). And if you’ve taken part in my free Canva challenge (pssst: get onto this now, I’ll be running another round SOON), you’ll know a lot about the tech stuff, and how to get Canva to do what you want. But here’s a couple of extra features that you may not know about that are available in the free version. 3 brand colours – Yep, even in the free version, stick in your three most commonly used brand colours, and you’ll save HOURS of your time because you won’t have to go into the colour picker every time and type in your hex codes. Go to the home page (the one that says “Create a design” at the top), and on the left-hand side, about a third of the way down your screen, it says “Your brand”. Click on that, and then you’ll see your three colour squares. Click on each one, and add in your hex codes. Now every time you add an element that you can change the colour on, your three brand colours will be displayed first on your colour selector. Up to 10 team members. You DON’T need CFW (Canva For Work) if you have a VA, or work as part of a joint venture with one or two other people. Click on “Create a Team”, and email them an invite. Easy done. Now you can all collaborate and add in stuff. Use the ‘paid’ templates for free. This is a great hack I came across a while ago. When you choose a size for your graphic (such as a presentation), you might see a template that looks great but has the unwanted “$” symbol on it and so you sadly go off to find something else. Don’t panic – the only reason those templates are paid is that they contain paid elements, such as quality photos or vectors. So open up the template, see what the paid element is (denoted with the watermark grid and Canva logo), delete and replace it with something else that’s free, et voila ! Download it for free without breaking any rules or doing anything underhanded. Yes, there are most certainly times when paying for Canva For Work is warranted. However, some of the features they offer can easily be done with other programs or apps, and in some cases, those other programs or apps can do things a whole heap better. But quickly, let’s look at what you get with Canva For Work. load your own fonts – one of the biggest reasons most people choose CFW, and a very valid one if you frequently use all your fonts with lots of different copy. However, if it’s just your wordmark or URL that you want in a particular fancy font, and you’re happy using a text font for everything else, then I would recommend using something like pixlr.com/editor to create your wordmark in your own fonts on a transparent background, and download it as a .png. Then you can upload it as an image into Canva, and you can easily add it to ANY graphic you make, for free, with no hassle. multiple and extended brand palettes – if you have a couple of different businesses or projects, and you need more than one palette, then this might be a good reason to use CFW. Or else, put up with having to add your hex codes each time for each graphic. If you set up a template (i.e. one image at the top of a document that you copy down and alter each time you need a new thing), then you can save yourself some of this hassle, because Canva keeps all of that document’s colours in the colour selection box. You can have up to 30 pages in one document, so you can get 30 graphics out of one template, ad using the same colour palette. save with transparent background as .png. This is SO not a reason to get CFW. If you’re wanting to create a wordmark, or a proper logo, or any kind of symbol or image cutout with a transparent background, then there are way, way, way better programs to do this with. My personal preference is pixlr.com/editor for image editing, including getting rid of backgrounds on existing images, or Gravit Designer for creating vector-based graphics with or without transparent backgrounds. Both of these will also let you use your own fonts. magic resize for designs to easily cover different social media platforms. This would be a handy feature if you were making several graphics a day and working across multiple social media platforms. However, most of us as solopreneurs might stick to one or two platforms, and if you’re judicious in your placement of text and always keep it towards the middle of the graphic, then it doesn’t matter so much if the platform’s preferred orientation is vertical, horizontal, or square – you should still be able to read the text. The small amount of extra effort to do this doesn’t justify the monthly expense of CFW just so you can use one click and save a few minutes. unlimited folders to organise your designs. Again, a feature best suited to organisations that have large amounts of graphics. I find having two folders in the free Canva for current designs, as well as keeping the finished and downloaded ones organised in files on my own computer is quite adequate. extra free photos, illustrations and templates. There are MASSIVE amounts of free public domain images available on the web. You don’t need to pay for any of this kind of stuff. Pixabay, Stocksnap.io, Pexels, Stockio, Unsplash, and CreativeCommons.org are just a few off the top of my head – there are squillions more. organise your own uploaded photos into folders. Again, this may be handy if you upload a tonne of images. But you can also go through your existing uploaded images and delete the ones you don’t want to cut down the overwhelm. You can also copy an image between graphics, i.e. open the graphic with the image you want, select it, then Ctrl C to copy; go back to your new canvas, and press Ctrl V to paste. up to 30 team members. Solopreneur? As I said earlier, you can have up to 10 team members for free. You don’t need this. 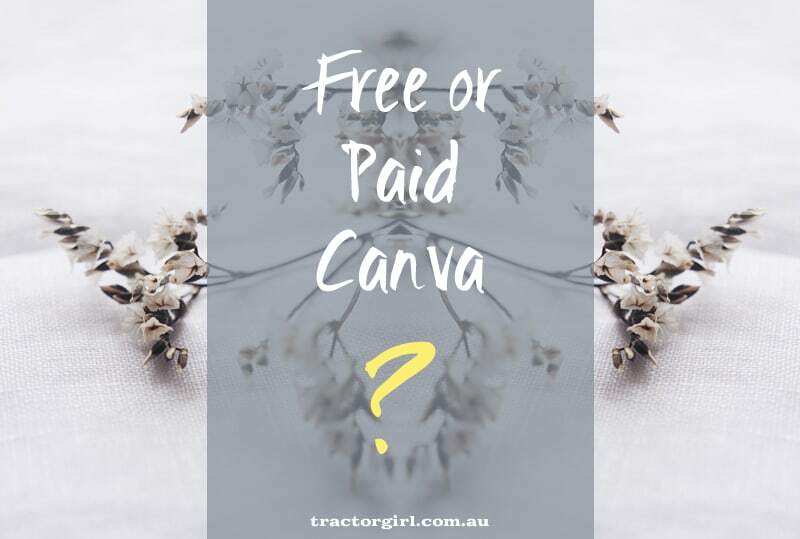 How do I decide – free or paid Canva? how many social media platforms do you use regularly? and do you specifically need your graphics in different layouts, or can you get away with simply centring the text so that the one graphic is adaptable to different situations? how complex is your branding, and do you have more than one brand that you need to create graphics for? Only YOU can answer these questions for yourself and your circumstances. But if you decide that a paid graphics program is what you desperately need because it allows you the flexibility, then you need to consider other paid options as well. While I agree that Canva is great (it truly is! for so many reasons), it’s still very much focused on creating graphics (images + text + shapes). That means that it’s not good at other things, such as image editing. If you need free image-editing, then Pixlr or BeFunky are perfect. And I can’t go past Gravit Designer for creating and editing vectors for free. So if you wish to combine any or all of those things, there are a few paid options. Several of the free programs noted above have paid versions with some excellent add-on capabilities. However, if you’re OK with the tech, my best advice of all is to bite the bullet and step up your game – and go for Adobe Creative Cloud (yes, hang out with the big guns). It includes Lightroom CC, and Photoshop CC, and the basic version is $14.95/month. Although it’s slightly more than the $12.95/month for Canva For Work, it’s totally amazeballs and you’ll get waaaaay more functionality out of it when you’re ready to step up. Ooohhh, love the template hack. I’ve always just used the free version. Figure graphic design isn’t my strong point and if I need anything more, I’d rather pay a person to do it for me, than pay for a platform. Hmmm, that sounds a bit glitchy? Have you tried logging out of Canva and logging back in to see if that makes them register? Or try logging in through another browser and see if that makes any difference (e.g. Chrome, or Firefox, or Microsoft Edge). If that doesn’t work, then contact Canva and ask them to sort it for you, as it’s definitely not working how it’s supposed to. Oops, thanks Dita! All fixed ?? Haha. I totally forgot about that paid template hack. 🙂 The little dollar symbol is quite misleading. But yes, it’s very cool that you can simply remove the premium element, and still use the design for free. I had no idea about setting your brand colours. That’s a neat little feature. Thank you for this article Julie. Yes! that dollar sign had me stumped for a while too. And yay for including your brand colours! You’ll love it – it’ll save you SO much time.